Kitchen Window: Chinese New Year, Trinidad-Style It may not be the first thing that comes to mind when you think of the Caribbean island, but Chinese food is as much a part of Trinidad as sandy beaches, palm trees and rum cocktails. And the New Year celebrations are a perfect showcase for the fusion fare. 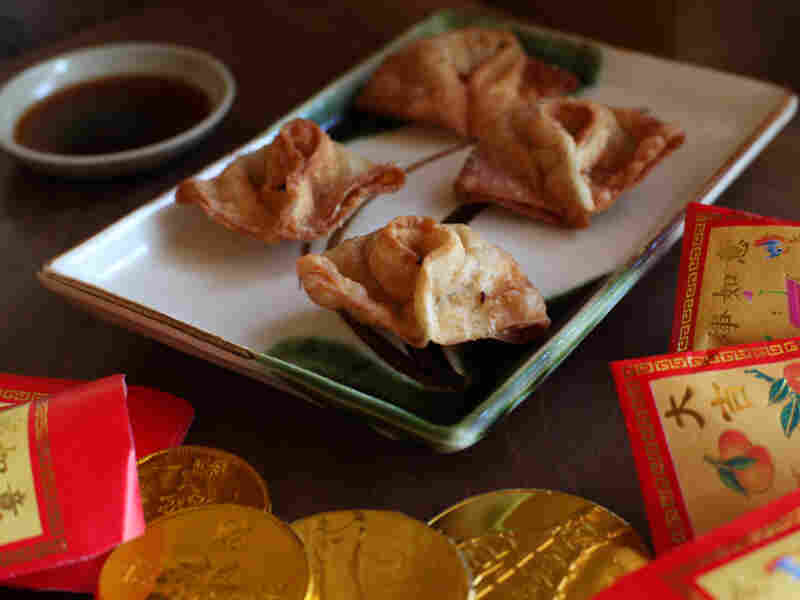 Get recipes for Fried Wontons, Shay Shay Tien's Pow, Eight-Treasure Trini Chow Mein, Dasheen Pork, Five-Spice Rum Pork And Vegetables, Bitter Melon With Onion Seeds, and Chinese Cakes. It's common to see Chinese New Year good luck symbols in retail centers in Trinidad, and parades, complete with dragon dances, are hosted by various Chinese associations islandwide. Consider the Caribbean island of Trinidad, and you might think of sandy beaches, palm trees and rum cocktails. What you probably don't think of is the riotous cacophony of a traditional Chinese New Year, with red and gold streamers, fireworks and dancing dragons. But Chinese New Year, just like Chinese culture, is deeply enmeshed with the larger culture of Trinidad and Tobago. Chinese were first brought to the islands in the 19th century as indentured laborers on British colonial plantations. They soon became part of the general population of Africans, Indians, Europeans and Syrians. Their influence on the island's food was profound, perhaps because once they left indenture, Trinidad's Chinese often owned the island's grocery stores. Like other transplants, they adapted their cooking methods to local ingredients. Some things, however, remained entirely intact. 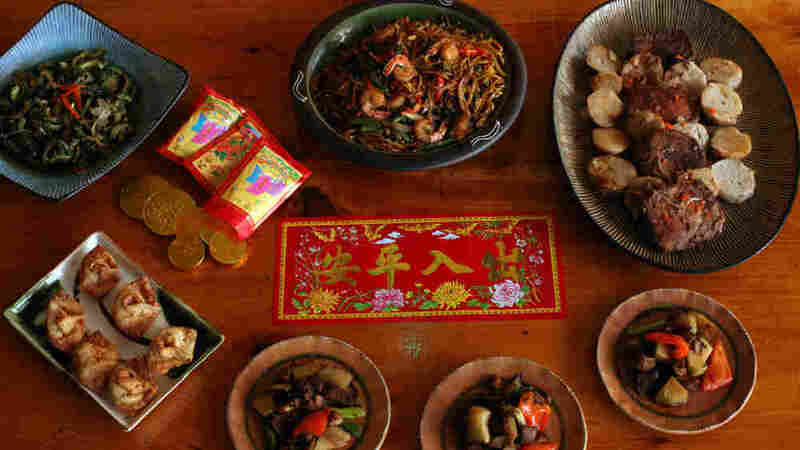 Grace Young's book Stir Frying to the Sky's Edge & Beyond explores Chinese cooking around the world, particularly in the Caribbean. She told me the steamed porked buns called pow in Trinidad are just like the steamed pork buns called bao in Hong Kong. For my part, growing up in the wonderful cultural melange that is New York, the Chinese New Year was always a must-do celebration. I spent a lot of my childhood trying to match my father's long strides as he walked purposefully around New York City's neighborhoods seeking the foods of his Trinidadian home. In Chinatown, he'd bargain for fish and vegetables such as bitter melon or bok choy. To my delight, our tours culminated in a visit to one of the many bakeries so we could get pow (or bao) or almond cookies. My father was impervious to the odd looks from the ladies behind the counter who strained to understand his West Indian accent. He didn't notice their curiosity because in Trinidad, Chinese food is staple fare. We eat fried rice one a week. Chow mein is as common as a casserole. Stir fries with calabaza pumpkin, taro root and hot pepper are everyday foods, and soy sauce is a regular ingredient in brown stewed meats. Ramin Ganeshram is a food writer and chef whose work has appeared in Saveur, National Geographic Traveler, epicurious.com and many others. She is the author of Sweet Hands: Island Cooking from Trinidad & Tobago (Hippocrene 2010) and the forthcoming kids' culinary novel Stir It Up! (Scholastic 2011). So, growing up in a West Indian community with many Chinese, my father considered bao regular Trinidadian food. 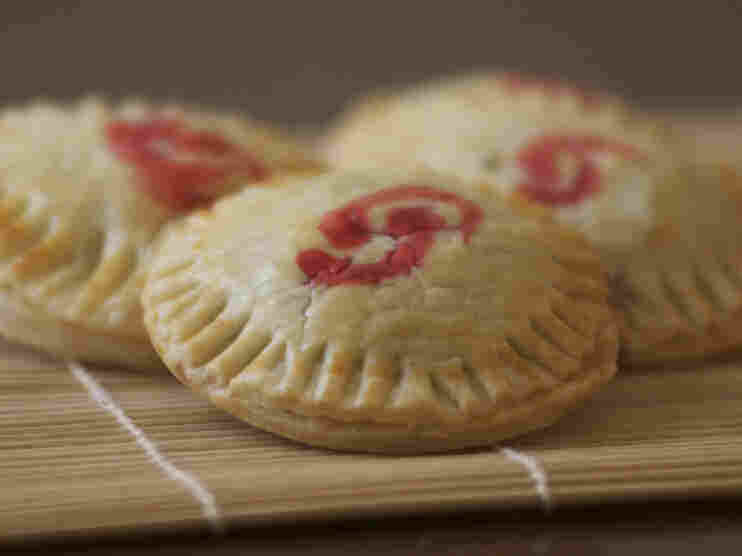 The same held true for red bean cakes — called, without political correctness, "chinee cake" in the islands — almond cookies and other Chinese sweets baked in a traditional style. There is, though, one major twist. In Trinidad, Caribbean mixed essence is a common flavoring for sweets and essential to baked goods. Similar to vanilla extract, it's redolent of pear and almond, although the original version was made from native tonka beans. In fact, these cakes and cookies are so popular that they are churned out by factories that supply standard bakeries not just in Trinidad and Guyana, where the Chinese food influence is just as powerful, but also in West Indian areas of New York, Toronto and London. To continue the family tradition, I've been taking my 5-year-old daughter to the New York City Chinatown parade since she was an infant. Afterward, though, I prefer to head home for a feast of traditional Trini-style Chinese dishes including pow to honor the memory of my father, red bean cakes to bring sweetness to our year and chow mein because noodles represent longevity. Keep in mind that Trinidad Chinese food is generally sweeter than American Chinese fare, and often uses rum instead of rice wine. Also, the Scotch bonnet pepper in many dishes adds a kick, but who doesn't need a little kick-start for a great year? Chinese takeout is as popular in Trinidad as it is in the U.S. — but, of course, it has a Trinidadian twist. This popular snack is livened up with the addition of hot pepper. You can make it with ground shrimp, chicken breast or lean pork. This recipe is adapted from my book Sweet Hands: Island Cooking from Trinidad & Tobago (Hippocrene 2010). Combine the ground shrimp, chicken or pork with the scallion, garlic, hot pepper and soy sauce and set aside. Fold the skin in half over the meat to form a rectangle. Fold the rectangle in half again lengthwise. The meat will be squeezed flat inside the wrapper. Bring the ends of the wrapper together so they meet each other, like a horseshoe, joining the inside edges together but leaving the outer edges free. Use a little water to pinch the dough closed. The wonton will resemble a little nurse's hat. Repeat until all the skins are filled or all the filling is used. Heat the oil in a saucepan until hot. Test by dropping a little flour into the pot. If it sizzles vigorously, the oil is ready. Add the wontons a few at a time, so they are not crowded in the pan. Fry until golden brown, then drain on paper towels. Whisk together the sweet soy sauce and vinegar and serve as a dipping sauce. 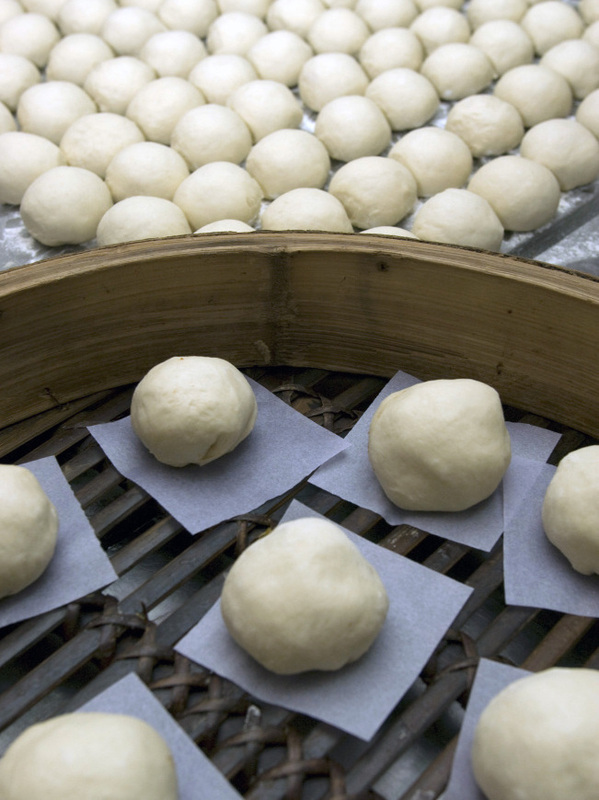 Steamed meat buns, called pow in Trinidad (an adaptation of the Chinese term bao) are a local favorite in Trinidad. It is widely agreed that the ones made at Shay Shay Tien, Trinidad's oldest Chinese restaurant, are the best. Owner Johnson "Chin" Achong shared the recipe when I was researching my cookbook. I like the flavor of hoisin and black bean sauces, but traditionally, char siu sauce is used, and you may do so here as well by simply substituting the char siu sauce for the amount of the hoisin and black bean sauces combined. To make miniature pow for an appetizer or starter, cut 6 pieces from each dough rope in step 5 and only use 1 rounded teaspoon of filling for each pow. Red food coloring is authentic for the look of the filling, but you can omit it. The recipe is adapted from my book Sweet Hands: Island Cooking from Trinidad & Tobago (Hippocrene 2010). Bring 3 cups of water, the salt and anise pod to a boil in a large pot. Add the pork and simmer for 25 minutes. Remove the pork, cool and cut into 1/4-inch cubes. Discard the anise pod. Heat the canola oil in a large, heavy-bottomed pot. Add the onion and garlic and fry on medium-high until dark brown. Remove from the oil with a slotted spoon and discard. Reduce the heat to medium. Add the dark brown sugar to the oil and let it caramelize for 1 to 2 minutes on medium-high heat. Add the pork and stir well. Brown the pork on all sides, then add ground anise, hoisin sauce and black bean sauce. Cook, stirring constantly, until nearly dry. Place the yeast and 1/2 teaspoon of sugar in a deep bowl and add the warm water. Set aside until foamy. Combine the flour, baking powder and remaining sugar together in a bowl using the paddle attachment of a stand mixer. Add the yeast mixture, egg white and melted shortening. Mix at high speed for 4 minutes, then at the lowest speed for 6 minutes. The dough should be smooth and highly elastic. Test the dough by pressing it with your finger — it should spring back without leaving a mark. Flour a clean dry work surface. Cut the dough into 4 equal pieces. With your hands, roll the pieces of dough into ropes about 3 inches in diameter. Cut each rope into 5 pieces. Knead each piece for 30 seconds, then form into a ball. Set the dough balls on a floured surface. Flatten one ball of dough into a 3-inch disc. Place a heaping tablespoon of the pork mixture in the middle of the disc. Gently pull the edges of the disc around the filling and pinch together to form a sac. Then gently twist the edges together and push down into the dough ball. The pow should be a smooth, round ball. Place the filled pow, seam side down, on a square of waxed paper in a bamboo or metal steamer insert. (If you do not have a steamer, preheat oven to 350 degrees and line a cookie sheet with parchment paper. Fill a large casserole dish or other oven–safe dish with 4 cups of water and place on the lowest rack of the oven. Arrange the pow on the cookie sheet about 3 inches apart. Brush pow evenly with egg wash -– 1 egg yolk beaten with 1 teaspoon water. Bake until risen and lightly browned. Place in the oven on the middle rack. 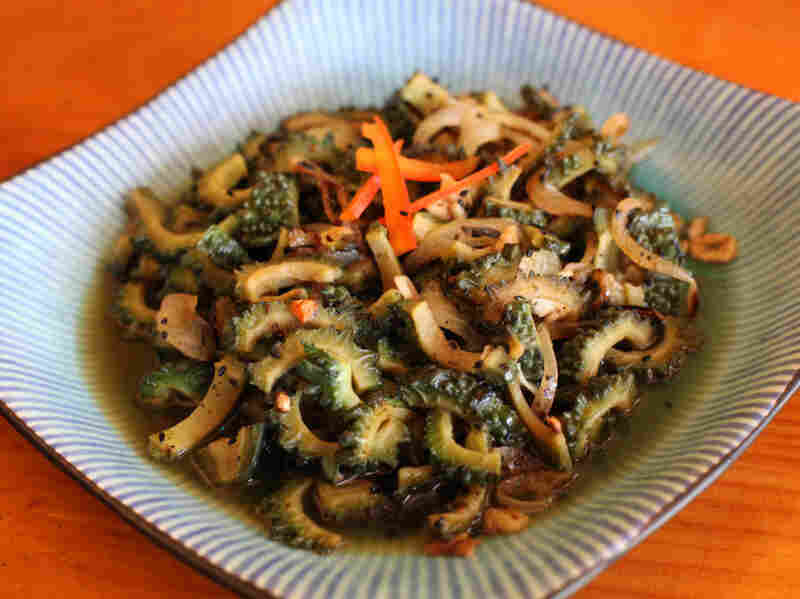 This is another dish that demonstrates the Chinese influence on the island. Except for the bean sprouts, there are no "traditional" Chinese ingredients as you would find in authentic stir-fries. 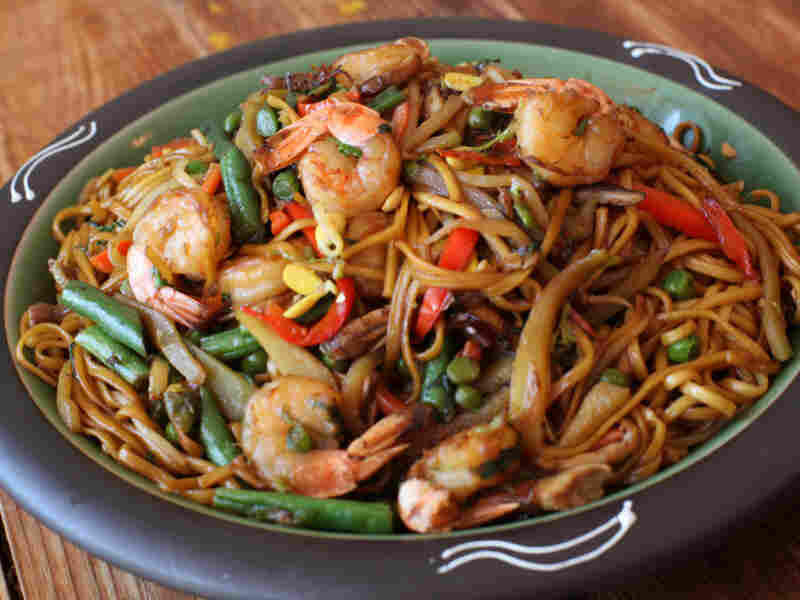 Although in the United States, crispy noodles are the hallmark of chow mein, the original Chinese meaning of chow mein is "a dish using soft noodles." Thick soy sauce is available in Chinese and Asian markets and looks like molasses. A little goes a long way, so use sparingly and up the amount as you go to suit your personal taste. The recipe is adapted from my book Sweet Hands: Island Cooking from Trinidad & Tobago (Hippocrene 2010). Bring a large pot of water and 1/2 teaspoon of salt to a boil and add the noodles. Lower heat to a simmer and boil noodles until tender, about 5 minutes. Drain, rinse with cold water, and set aside. Heat the canola oil in a large, deep frying pan or a wok and add the onion, cabbage, carrot and red bell pepper. Fry, stirring often, until the onion turns translucent. Add the squash, bean sprouts, if using, and hot pepper and toss well. Add the meat and fry until well browned on all sides. Mix in the soy sauce and stock or water and simmer 5 to 7 minutes to ensure the meat is cooked through. Add the noodles to the pan and toss well so all ingredients are incorporated and any liquid is absorbed. 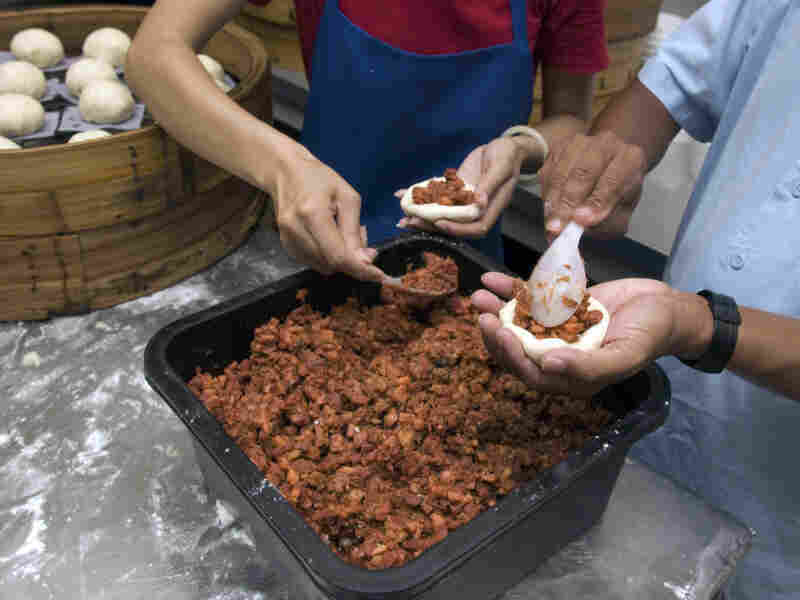 Dasheen pork melds local ingredients with old-world Chinese cooking style. It is an iconic Trinidad Chinese dish. Dasheen is the local word for taro. The recipe is adapted from my book Sweet Hands: Island Cooking from Trinidad & Tobago (Hippocrene 2010). Place the pork shoulder in a pot with the bay leaf, crushed garlic and crushed cloves. Add just enough water to cover and bring to a simmer. Cook for 30 minutes, or until the pork is tender. While the pork is cooking, bring a pot of salted water to a boil and add the taro. Simmer for 10 minutes, drain and set aside to cool. When the pork is tender, remove it from the pot, cool and cut into 1/2-inch-thick slices. Place in a bowl and add the soy sauce and rum. Mix well to coat all sides of the pork. Heat the oil in a large skillet and add the pork (reserve soy-rum mixture), browning on all sides. Remove and allow to cool. 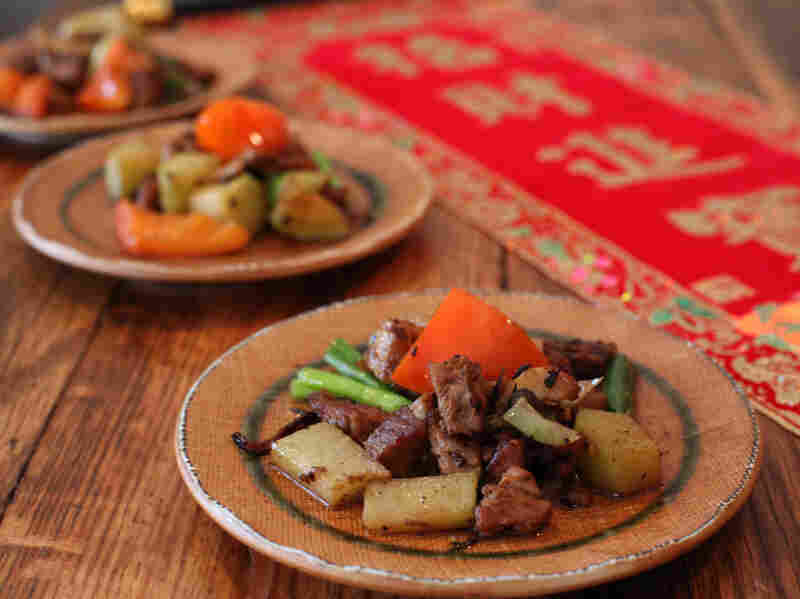 Place the pork in a bowl and add the minced garlic, ginger, bean curd, onion, green seasoning and five-spice powder. Mix well to coat. Preheat the oven to 350 degrees. 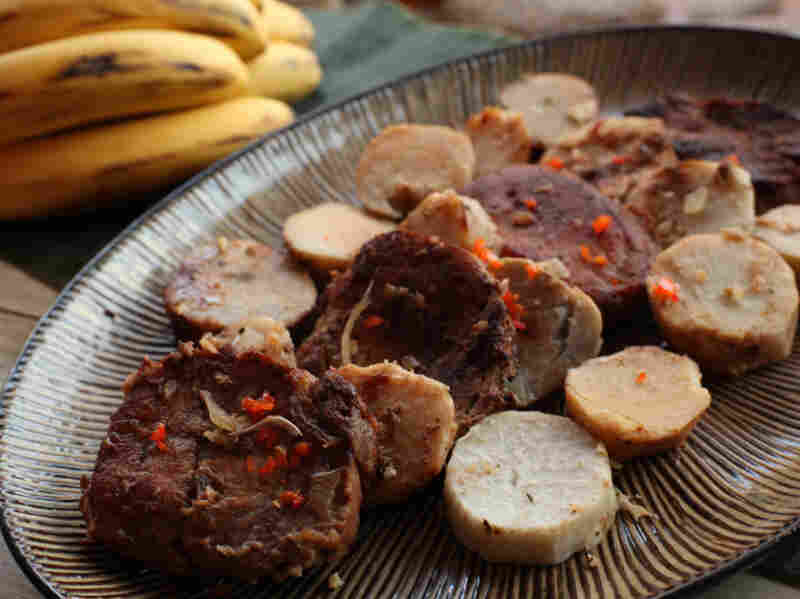 In a large baking dish, arrange the taro and pork slices in alternating layers, and pour any reserved soy-rum mixture on top. Cover with aluminum foil and bake for 45 minutes, or until the taro is fork tender and slightly translucent. Green seasoning is unique to the Caribbean and differs slightly from island to island. It is used in a huge number of Trinidadian dishes, whether African, Chinese or Indian. In Trinidad, it's distinguished by the use of shado beni or Mexican culantro (recao), a local herb very much like cilantro. Fresh shado beni can be found in West Indian and Spanish markets. If not, fresh cilantro is a good substitute. The recipe is adapted from my book Sweet Hands: Island Cooking from Trinidad & Tobago (Hippocrene 2010). Process all of the ingredients in a food processor until the mixture forms a thick paste. Alternatively, process in a blender with 2 tablespoons of vinegar. Use immediately, or refrigerate in a tightly sealed glass jar for up to 1 week. This is a dish that I created using leftover ingredients I had on hand, but is very much in the style of any Chinese stir-fry in Trinidad, using meat, sweet soy sauce, rum and hot pepper as key ingredients. It is good with plain white rice or a flat bread such as pita or roti. Chicken, shrimp or beef can be substituted for the pork. In a medium bowl, whisk together the soy sauce, mirin, rum and salt. Add the cubed pork and stir well to coat. Cover with plastic wrap and refrigerate for 1 hour. Heat a wok or a wide skillet on medium-high and add the oil. Heat the oil for 30 seconds and then add the onion, ginger and Scotch bonnet pepper. Fry, stirring continuously, for 15 seconds, and then add the garlic slices. Fry for 1 minute more, or until the garlic begins to brown. Add the pork pieces and stir well to coat. Fry 2 to 3 minutes, or until the pork starts to brown slightly, stirring often. Add the squash, onion and bell pepper and stir well, cooking for 2 minutes. Add the shredded cabbage and stir well to coat. Pour in the water and stir well so all the ingredients are combined. Simmer for 10 minutes. The cabbage should be wilted and the pork cooked through. Add the scallion pieces and toss lightly. Cook for 1 minute more and pour into a serving dish with sauce. Caraili, a type of bitter melon, is a standard vegetable in East Indian and Chinese diets. There are two varieties. One is light green and resembles a knobby-skinned cucumber, while the other is darker green and very gnarly in appearance. If you like collard greens, escarole or other bitter vegetables, you'll find caraili appealing as well. It is readily available in Asian and Middle Eastern markets and sometimes makes an appearance in the tropical produce section of larger grocery stores. Although you could substitute zucchini in this dish, the characteristic bitter flavor would be missing. The recipe is adapted from my book Sweet Hands: Island Cooking from Trinidad & Tobago (Hippocrene 2010). Prepare the caraili by trimming the stem ends and slicing them lengthwise. If there are large, visible seeds, use a small teaspoon to scrape down the middle of the caraili to remove them. Discard the seeds and slice each half of the caraili into 1/4-inch slices. They will look like half moons. Heat the oil in a wok or large, wide frying pan. Add the onion and saute until translucent. Add the garlic, frying until golden brown, about 30 seconds. Add the kalonji seeds and fry until they begin to pop, about 15 seconds. Add the caraili and stir well, frying for 1 to 2 minutes, or until they begin to brown. Stir in the salt and black pepper, reduce the heat to medium-low, and cook until the caraili are soft, about 15 minutes. Serve with rice or flat bread such as pita or roti. Bean cakes made from kidney or black beans, and even sometimes black-eyed peas, are a local variation on Chinese moon cakes made from adzuki beans. Popular in Trinidad and, even more so, Guyana, I've never seen a home cook prepare these, as a number of good local bakeries usually have them on hand. Here is the recipe I've developed for these cakes, which you will find varies slightly in taste and appearance from the authentic Chinese version. The recipe is adapted from my book Sweet Hands: Island Cooking from Trinidad & Tobago (Hippocrene 2010). If using dried beans, drain them. Place in a pot with 3 cups of clean water and simmer for a half-hour. Add the anise pod and simmer for another half-hour, until beans are very tender. If using canned beans, drain in a colander, rinse with cold water. Place in a pot with 3 cups of clean water and the anise pod and simmer for 15 minutes. Drain the beans, removing and discarding the anise pod. Place beans in a food processor and puree until smooth. Push the pureed bean mixture through a fine mesh sieve to remove any remnants of skin. Combine the bean puree and sugar in a saucepan and place over low heat. Simmer, stirring often, until sugar is dissolved and mixture resembles a thick paste, about 10 minutes. Remove from heat, stir in the mixed essence and set aside. Combine the flour and salt in a bowl or the bowl of a food processor. Using a pastry cutter, your fingers or the pulse setting on the food processor, cut in the butter until pea-sized balls form. Add ice water in a thin stream, mixing until a shaggy, dry dough just forms. Add just enough water so no flour remains but the dough is far from sticky. Wrap and chill in the refrigerator for 2 hours up to overnight. Remove the dough from refrigerator and cut into 8 pieces. Form each piece into a small ball and roll out to a 1/4-inch-thick disc. Place 1 tablespoon of the bean mixture in the center of a disc and brush the edges with egg wash — 1 egg yolk beaten with 1 teaspoon water. Place another dough disc on top and, using a fork or your finger, press the seams closed. Repeat with remaining dough discs. Place cakes on a baking sheet lined with parchment paper and chill in the refrigerator for 15 minutes. Preheat the oven to 350 degrees. Remove the baking sheet with the cakes from the refrigerator and brush the cakes with egg wash. Place the cakes in the oven and bake for 25 to 30 minutes or until the crust turns golden brown. Remove and cool. Once cool, dip the paintbrush in the red food coloring and paint a 1/2-inch-wide circle or design of your choice onto the center of each cake. Serve.